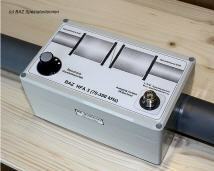 BAZ produce antennas for Mobile Phones GSM 900 in the designs as Yagi antenna and omnidirectional antenna. The GSM 900 Yagi antennas has the highest gain due to its narrow opening angle and radiation pattern. Again in the range of BAZ special antennas the GSM Yagi antenna D/Y13 is prof, an antenna for GSM of 900, very suitable GSM of networks professional for the application as example the data packaging service and data alignment of combined heat and power stations, the water management and similar services, which operate in the GSM 900 network.